Posted on Tuesday, March 31st, 2015 at 10:01 am. A new garden which has been developed for patients with dementia and stroke opened at the Princess Royal Hospital in Telford on Thursday. The Memory Garden, has been created almost entirely thanks to the kindness of local business and volunteers, and can be seen from a corridor leading to Ward 15 at the hospital. It is one of two developed at the Princess Royal Hospital by The Shrewsbury and Telford Hospital NHS Trust after it won a national competition on NHS Sustainability Day last year. The second – a Garden of Reflection, designed as a therapeutic environment for patients who have had a stroke – will open next month. The opening of the Memory Garden was just one of the events which the Trust held to mark the national NHS Sustainability Day. A variety of stands were available outside the Apley Restaurant for patients, visitors and staff to find out about more the Trust’s environmental work. Staff could also have free bicycle checks at the hospital from Dr Bike and find out more about the Trust’s health and wellbeing programme. The events came just a week after the Trust was shortlisted for its environmental work in five categories in the NHS Sustainability Awards 2015 – more than any other trust in the country. “As a Trust we feel we have a big part to play in looking after our environment and today gave patients, visitors and staff an opportunity to find out more about our sustainability programme. “The centre-piece of today’s events to mark NHS Sustainability Day was the opening of our Memory Garden at the Princess Royal Hospital, which is part of our on-going commitment to support patients with dementia. “We’re grateful to everyone who has helped to make this a reality and look forward to the opening of our second garden next month. Julia and Professor Peter Latchford, Trust Chair, opened the garden in the presence of volunteers, patients, staff and other members of the Trust Board. Two indigenous trees were also planted today as part of a national scheme run by NHS Forest. Work on the two gardens was made possible after the Trust won a prize on NHS Sustainability Day last year which provided SaTH with a free landscape design from Design With Nature. With a limited budget available to the Trust, almost all of the work has been carried out through volunteers and local businesses donating their time and support to this project. The centrepiece of each garden will be a magnificent sculpture, each donated by the Friends of the Princess Royal Hospital. 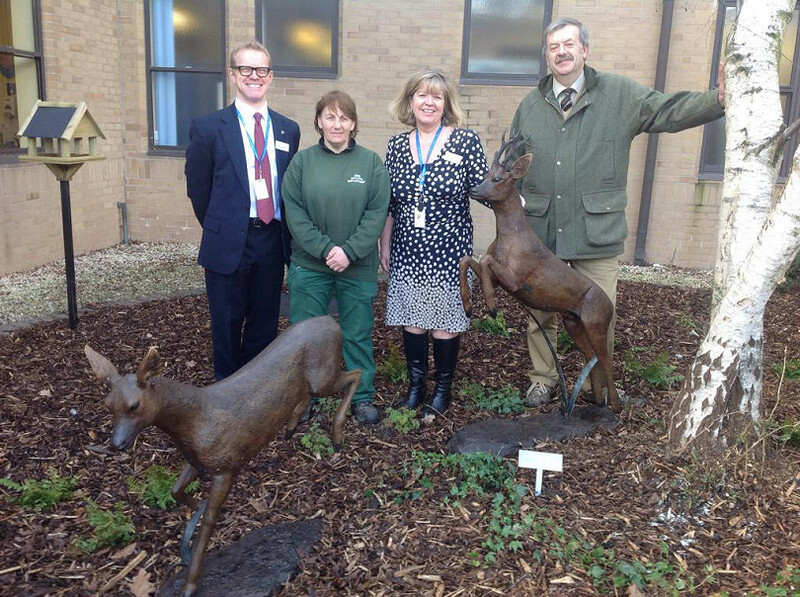 The sculpture in the Memory Garden is of two leaping Roe Deer cast in bronze, while the Garden of Reflection will feature a bronze sculpture of a Copper Beech Tree.